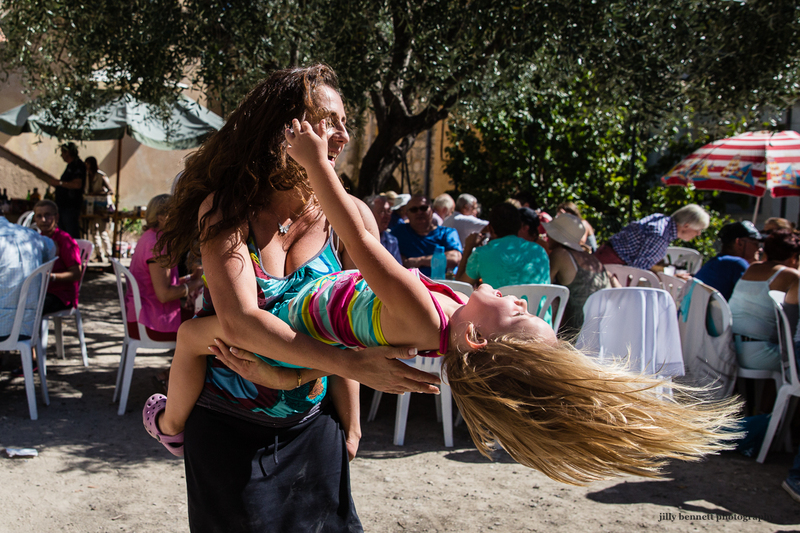 The Fete du Four took place yesterday in Gorbio village. Once a year the ancient communal oven is lit and everyone brings their dishes to be cooked by Franco. And then we eat and drink, dance and sing. Food is shared around and a good time had by all. Here Auriane, who has two children of her own, is playing with Alice, the daughter of her neighbour. Gorbio is like that! One big family. La Fête du Four a eu lieu hier dans le village de Gorbio. Une fois par an, l'ancien four communal est allumé et tout le monde apporte ses plats à cuire à Franco. Et puis on mange, on boit, on danse et on chante. Les plats sont partagée à la ronde et c'est un bon moment pour tous. Voici Auriane, maman de deux enfants, qui joue avec Alice, la fille de sa voisine. Gorbio est comme ça! Une grande famille. Sounds like a fun day, for everyone. What a perfectly timed shot! Joyous image. That spirit of community is completely absent in so much of the US.